This is the closest I will probably get to being a beach bum. Were it not for a tiresome propensity for burning I might do it a lot more. When our maker was handing out different skin types, mine was a shortened straw…how I would love to be able to bronze up rather than being the laughing material of the gorgeous apparitions (of the female vary) on the beach. The upsidedown thing is that in all the chemists and shops, the number one product for sale has been for skin whitening…that has been the case in every country since Iran. I'm sitting on the veranda of small beach hut on the island of Perhentian Kecil, off the East coast of Malaysia. Batty is tucked up safe and sound in a private car park whilst I've taken myself off for a week of idleness and calm. It may sound like nonsense needing a break when I am on a big break, but the last couple of months have not been plain sailing, what with the new engine stuck in customs, and then it failing on numerous occasions and having to rebuild it 3 times in Thailand. At the end of my last post I was still bit of a nervous traveler, just expecting there to be more trouble and headaches. Well I am very glad to report that since then she has been a model of reliability. I played around with the settings on the fuel pump/injector and now seem to have got it about right. I did have one near calamity, but that was to do with the rear wheel bearings collapsing. Initially I thought it a flat tyre, but in fact it became very clear what was amiss when ball-bearings started dropping out of the axle. It was blazingly hot, and this turn of events really confounded me. Luckily just as I was about to trudge up the road to find help, it occurred to me that I had some spare bearings and was in the process of digging them out when a local chap screech to a halt on his bike and offered to take me to a mechanic. I tried to explain that I could fix the bike and showed him the new bearings, he immediately grab them and started putting the wheel back together again. So kind, so generous but alas there were a couple of washers he did not put in which caused a few problems later. The big problem I have now is how to resurrect the veggie oil use. I have written on a couple of bio diesel bulletin boards in America and in Australia and have received a lot of ideas and offers of help, to say nothing of gallons of bio diesel. 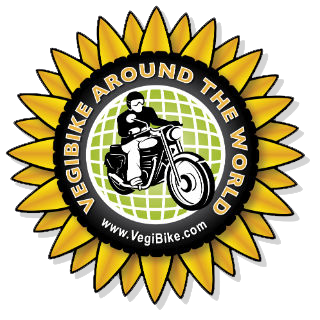 Overwhelming, and I think it has put me on the right track to resume the use of veg oil. I only had a few days left of my Thailand visa, so I had to cut short a lovely stay in the town of Hua Hin, where my secret friends in Chiang Mai had very kindly offered the use of their seaside room in this Royal resort, south of Bangkok. 2 long days in the saddle took me to Malaysia which I crossed at the rather pretty, underused western border of Khuan Don. That was a breeze and through in half an hour. There is an extraordinary sense of relaxation when you have 3 months automatic Visa stamped into the passport, it is such a welcome and certainly put me in a very positive mood about this new country I was entering. It was a bitter sweet feeling leaving Thailand. I guess Thailand is not to be the land of opportunities for me, and I had so want it to be one. There must be a vibe that just does not resonate with me. Twice bitten and all. Both Susie and Chloe had recommended going to George Town (a World Heritage town ) on the island of Penang. It is on the west of the country and a huge long bridge links it to the mainland. Chloe had been that lots of times suggesting various sites and Susie introduced me to a fellow biking friend called Sam. Sam has his own law practice and is about my age, he immediately flew into action inviting me to join him and friends for lunch followed by dinner and then lunch again the next day. Everyone in his gang were super kind and enthusiastic about making this lonesome traveler very welcome. I visited the Blue Mansion, a relatively modest but architecturally rich house in the heart of the town, built by a tycoon a little over 100 years. He had made the mistake of entrusting it for the lifetime of all his children, and bestowed an annual sum of $200 (a great deal then) for its maintenance. Alas it was not indexed linked and the family had to rent it out for the last 50 years and deteriorated badly. Fortunately it has now changed hands and being restored to much of its former glory. The next day I rode around the island which was about 50 miles, lots of fishing villages, plantations and all connected by some lovely twisting roads. Afterwards I took the train up to the hill station overlooking Georgetown. It was one of the 1st hill stations that the British built in Malaysia. The railway connecting it was an adventure in itself. It climbs up at the incredibly steep angle up the hillside to a stunning position overlooking the island and main land. The 1st attempt to build the railway failed as the engineering wasn't quite right, sensibly the Swiss were then asked to help and they, in the 1920s, set up a very reliable and efficient system. View from Penang Hill, George Town in fore ground and the connecting bridge crossing to Butterworth. To get to the Perhentian Islands involves crossing the Malay peninsula and that was nearly a day in the saddle. I wanted to get to the small fishing town of Kuala Besut as early as I could to organise the bike and the trip to the islands. The 7 o'clock start would have ensured it, but for the lack of attention I paid to the route the GPS had mapped out. It was only after about an hour that I realised the lack of logic in our direction. By the time I had got the route properly set and made up for, I was probably 2 hours behind. I don't get angry very often, but I was seething at my stupidity and the poor quality of the maps I have for Malaysia on the GPS. This was quickly forgotten as 150 miles of beautiful and fun road then connected me with the East Coast. I will let these pictures do most of the talking, as this is a beautiful island. It is early season, in fact most places are only just opening. I have been in this little resort for 3 nights and it is only now that there are others beginning to drift in. 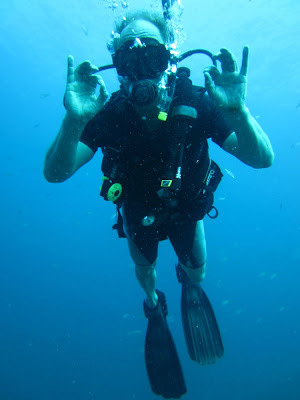 14 years ago I did a PADI diving course, and apart from one brief dive the next year, it has been a dormant hobby. One can do a refresher course here, which I did and now enjoy the wonders of the deep again. In a couple of days time I should have worked out how best to ship to New Zealand. It seems to be quite an expensive leg, which has rather taken me by surprise. I guess there is less freight going to New Zealand. From the island I will head down towards Singapore via the Cameron Highlands which are meant to be lovely. great to hear that all is well now with batty. Noel and Christy will be in Kuala Lumper in a few days time, do email me or text me if you want their tel number, if you happen to be there. 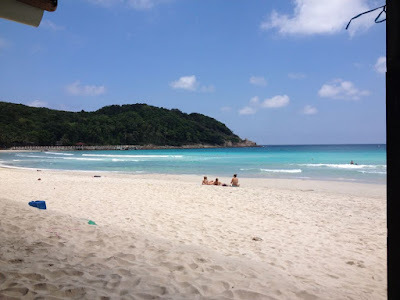 We did the Perhentians in September and I was led to believe the place shut down in October not to open again until April! Glad to see that you can still visit. Truthfully I think at high season the place would be not so much fun, but at low it was lovely! That is SOME view from Penang Hill, Harry.